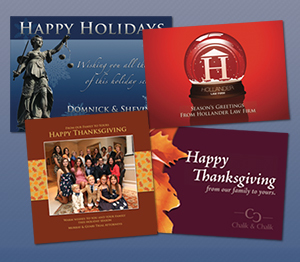 How Sending Holiday Cards Benefit Your Law Firm. The holiday season is fast approaching. Now is the time to take advantage of the marketing benefits of sending your prospects, clients, referral partners and vendors a personalized and customized holiday card. Sending a holiday card is a great way to acknowledge and thank those who have supported your law firm throughout the year, to send warm wishes, and to stay top of mind. Holiday cards do leave a lasting impression and often show that your company is financially stable and successful. October is actually a good time to start your holiday card planning. It allows you plenty of time to design your card, prepare your mailing list, and get your cards to the printer in-order to have an on-time delivery. There is nothing worse than a late holiday card. If you are able to personalize and hand-sign your cards, you will appreciate the extra time needed to get this done. At BARD Marketing we offer a variety of print media services including the creation of branded and customized law firm holiday cards for a variety of holidays including Halloween, Thanksgiving, Hanukah, Christmas, Kwanzaa, New Years, and more. Want to Design Your Own Card? Get Started Today!